Project obstacles and solutions: Berry Plastics was building a new warehouse in Evansville, Indiana. A&S Construction was selected as the general contractor on this project and Empire Contractors were hired to do the concrete work. Empire made plans to form the walls on the job site instead of ordering pre-cast walls. 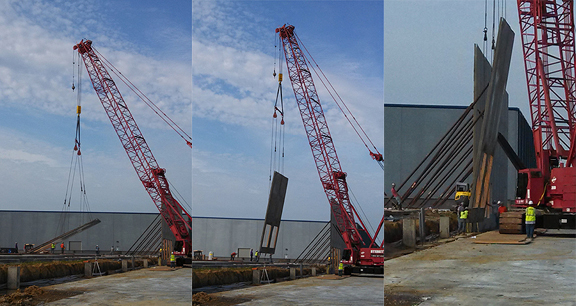 Tilt-up walls are used to reduce construction costs, particularly the shipping costs for pre-fab concrete walls. However, tilt-up walls require a concrete mix that is not only strong in terms of compressive strength, but also in terms of flexural strength due to the stress put on the walls during placement. IMI supplied 3,000 yards of high flexural strength concrete for the wall construction. This project was awarded a 2013 Excellence in Concrete Award from the IRMCA. For more information on wall construction, click here.